St. Modomnoc (also Domnoc, Dominic) lived in the first half of the sixth century. This name, by which he is commonly known, means “my Domnoc”, or “little Domnoc”. Irish hagiographers used to add the prefix “mo”, which means “my”, “little”, “dear” before the names of saints whom they particularly loved and venerated. The name “Domnoc” is of unknown Irish origin, while the name form “Dominic” means “belonging to God”. St. Modomnoc descended from the royal family (or, to be more exact the clan) of O’Neil in Ulster, Northern Ireland. With all his heart young Modomnoc wished to serve God as priest, so he went to Wales to receive a good education and training in the great monastery of Mynyw, or Menevia (now St. Davids) under St. David, the patron-saint of Wales. Unlike other disciples of the great Abbot David who practiced manual labor, church singing and grew vegetables, the young ascetic Modomnoc had beekeeping as his obedience. Modomnoc loved this obedience very much and took great care of the little creatures that were in his charge. He looked after them, kept them in specially-made straw beehives in a sheltered corner of the large monastery garden where he grew the most beautiful flowers that were loved and appreciated by his bees. Modomnoc often talked to the bees and they, in their turn, flew in swarms around his head, as if speaking to him in their language and expressing reciprocity for his affection. At the end of the summer the bees provided St. Modomnoc with such a great amount of honey that he needed helpers to deliver it to the monastery. Owing to Modomnoc and his faithful bees, the monks of Mynyw Monastery had honey in abundance. 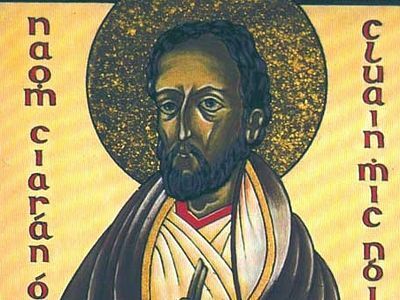 St. Modomnoc always thanked God for sending him such an obedience. All the other monks were afraid of the bees and avoided walking or appearing in the corner of the garden where the Modomnoc’s bees lived because they could sting them, but the insects never stung Modomnoc himself. Several years passed. It was time for St. Modomnoc to return to his native Ireland and start his priestly ministry. According to tradition, a whole swarm of faithful bees flew after their beloved master to Ireland. This is how it happened. The day before his departure, Modomnoc bid farewell to his holy abbot and the brethren and at the end came to the garden to say goodbye to his most beloved friends, the bees, knowing that he would miss them in Ireland. The bees, as if feeling that their dear father was going to leave, flew out of their beehives and with extremely loud buzzing started whirling around the saint (several hundred thousand of them!). 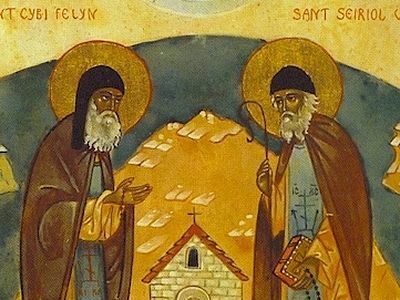 All this time the monks stood at a distance from the holy man, greatly amazed. St. Modomnoc got on the boat and departed for Ireland. However, before he had sailed three miles he suddenly saw a small black cloud that was swiftly approaching from the Welsh coast. Soon the cloud drew near and the holy man to his great astonishment realized that these were the bees from all the beehives of the Mynyw Monastery. The insects began impetuously and joyfully descending onto the boat of their master. 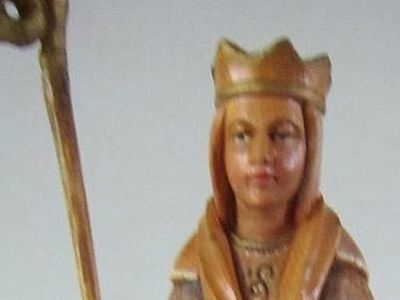 St. Modomnoc, taking pity on the monks who would be deprived of wonderful honey, and fearing for the safety of bees which could all perish during the journey from Wales to Ireland, commanded them to fly back. But the tiny creatures this time were far from obeying their protector. Meanwhile, the sailors, fearing the bees, implored Modomnoc to make a decision as soon as possible. And the saint had to ask the sailors to turn back to Wales. The brethren of Mynyw were really staggered on seeing St. Modomnoc returning together with all the bees to Wales! 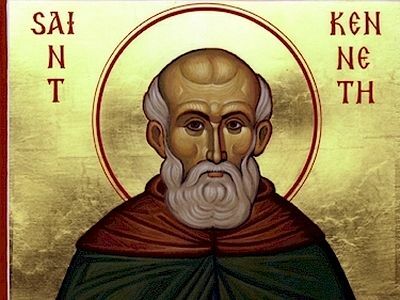 The holy man related to the abbot what had happened to him and St. David suggested he set sail the following morning, but this time with no farewells to the bees. Modomnoc did what was told him. But the event was repeated: when the saint had covered three miles by sea the bees in the shape of a cloud caught up with him. Then the man of God resolved to sail back to Mynyw again. The abbot, seeing that Modomnoc had to return already twice, said to him: “Modomnoc, I give you these bees. Take them with my blessing. I see they will not be able to live without you. And we will obtain new bees for us.” Modomnoc agreed to fulfil the will of the abbot; but he had to persuade the sailors for a long time to take the bees with them. On parting, St. David told Modomnoc that the bees would not do any harm to the sailors as long as the saint stayed aboard. Before leaving, Modomnoc prayed so that the bees, if that was the will of God, might remain to live in the garden of Mynyw as they could all die during their flight to Ireland. However, even this time all the bees flew after their master. Modomnoc made a shelter for the bees on his boat and all of them on his command moved there, patiently waiting for the end of the sea journey, doing absolutely no harm to the sailors. 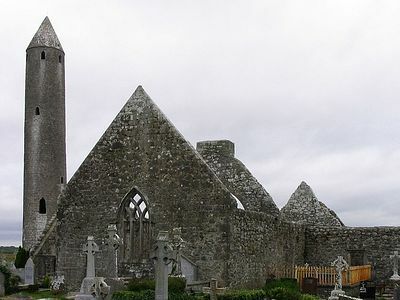 Upon his arrival in Ireland, according to tradition, St. Modomnoc erected a church in Bremore near the town of Balbriggan, in present-day County Dublin. Near the church, as the tradition says, he settled the swarm of his bees in beehives in an amazingly beautiful garden that resembled the garden in Mynyw. This spot is known as “the beekeeper’s church” (“Llan-Beach-Aire”) to this day. Thus, Irish people from ancient times believe that the bees as well as beekeeping appeared in their country due to St. Modomnoc. Most probably, arriving in Ireland, Modomnoc undertook missionary work and served as a bishop of Ossory. There is a tradition that St. Modomnoc ended his days as a hermit in Tibraghny in the south-west of the present-day County Kilkenny where he was especially venerated. Our holy father Modomnoc reposed in the Lord in about 550. The name of Modomnoc was included in the “Martyrology of St. Oengus” from the Tallacht Monastery. 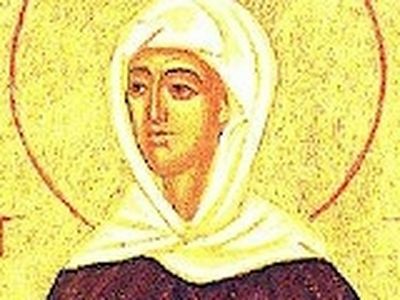 Specifically, St. Oengus wrote: “In a little boat, from the east, over the pure-colored sea, my Domnoc brought… the gifted race of Ireland's bees.” By the way, approximately at the same time as St. Modomnoc in Ireland lived a holy woman named Gobnait, who was Abbess of Ballyvourney in County Cork and a wonderworker (commemorated February 11/24—just two days before Modomnoc) who was a beekeeper as well. Researchers suppose that her bees were relatives of the bees of St. Modomnoc. St. Modomnoc is widely venerated as the patron-saint of bees and beekeeping to this day. Holy Father Modomnoc, pray to God for us! Ciaran was educated by the prominent theologian St. Finnian of Clonard, the spiritual father of the “Twelve Apostles of Ireland”. Here he showed himself to be a most gifted student and one of the most zealous monks.